Can Troy be somewhere else? A blow for Troy at Bergama? THE TROJAN BATTLEFIELD FOUND AT LAST! Author John Crowe uses Homer’s epics about the Trojan War, the Iliad and Odyssey, as the foundation for his research. Composed around 2,700 years ago, these provided the Western world with the foundations of their literature and education. They have had an enormous influence upon western culture. But where is the battlefield of the Trojan War as described in the Iliad? Whether or not Troy existed, the Iliad does exist. And whether or not the Trojan War actually took place, both the battles and the landscape of the battlefield are described in great detail in the Iliad. Schliemann claimed he found Troy at Hisarlik, and many believed him. More recently others have found Troy near Cambridge in England, in Yugoslavia, and in the Baltic. Yet no-one has managed to find the Homeric Trojan plain. So it is widely believed that it never existed. John’s approach is different. First, he aims to find the Trojan plain. Once found, it will surely lead us to Homer’s Troy. 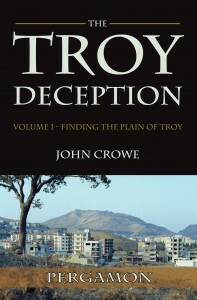 In Volume 1 he shows, beyond reasonable doubt, that the plain of Troy is now found at Pergamon. It lies in the lower valley of the Bakir Çayi, due east of the island of Lesbos, in a region known to the ancients as Mysia. It seems a little known fact that Achilles in the Iliad told us that here is exactly where we should expect to find the lands of Troy. And another little known legend tells us that the Achaeans fought in this valley and captured Teuthrania before they went to Troy. So here is the obvious place to start looking for the plain of Troy. In Volume 2 John will show how the acropolis of Pergamon fits the description of Ilios in the Iliad. It still bears the name which Homer gave to Apollo’s precinct on the highest terrace – Pergamos. The ancient Hittite tablets tell us that Taruisa (Troy) and Wilusa (Ilios) were two separate places, yet there is only one settlement site at Hisarlik. Homer’s descriptions tell us that Troy and Ilios were separate walled cities. Ilios was a ‘holy’ city on the acropolis, and Troy was the lower town on the edge of the plain. We know that Troy had a ‘Dardanian Gate’, which probably opened on to the road which led to Dardania. Close to this gate was a geothermal spring. So we should look for Troy close to the ancient warm spring known today, and to the Romans, as the Asklepion. John explains the Troy deception in more detail. John’s discoveries add a new and unexpected degree of integrity to Homer’s descriptions of the Trojan landscape. He presents knowledge that has been hidden from the world for over 2,500 years, giving Homeric scholars the opportunity to reappraise the historicity of both the Trojan War and Homer, perhaps the world’s greatest epic poet. John hopes his findings will enhance the credibility of Homer as a witness of ancient history. His studies were inspired by John Lascelles, who first discovered Troy at Bergama and in 2005 wrote ‘Troy: The World Deceived – Homer’s Guide to Pergamum’. The Troy Deception will appeal to all those who are interested in the origins of western culture, and to those who love detective stories. The Troy Deception uses Graphene theme by Syahir Hakim.